Posted August 12th, 2015 at 10:40 am. “I knew if I wanted to work in archaeology, I needed to attend a field school,” explains Bridget Murray ’17, an anthropology and linguistics double major. Her summer internship at the Sewanee Environmental Institute’s Summer Field School in Archaeology provided her with hands-on experience—and the chance to reinforce just how much she enjoys the field. Housed at the University of the South in Sewanee, Tennessee, the program is an intensive summer course in archaeology methods and practice. 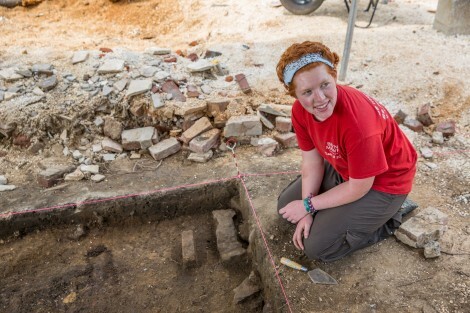 The program began with work in prehistoric Southeastern archaeology at Pinson Mounds State Archaeological Park, but most of Bridget’s summer was spent at an excavation unit on campus. The excavation, which followed the disassembly and salvage of what was left of the 148-year-old building, provided researchers with the opportunity to explore the remains of the structure and its grounds.